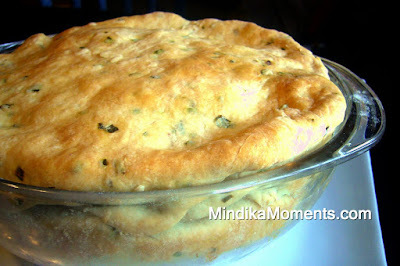 I'm known for my Chicken Pot Pie...it's one of my most popular original recipes. It was the first thing I cooked for my husband when we were dating, and he tells me now that it definitely helped seal the deal. So I thought if the chicken pie could melt his heart...what power may lay in a beef variety?? 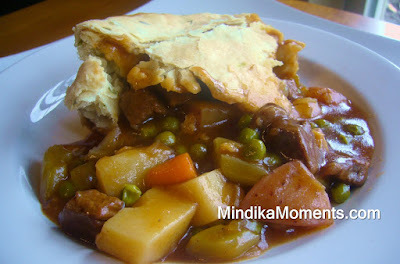 When I got this month's Cuisine at Home, including a Beef Pot Pie idea, I knew I had to try. I used their crust recipe because I loved the chives mixed in, but I decided to come up with my own filling. A triple helping, multiple praises, an offer to do the dishes, and a free back rub! I'd call that a success! Even better...only 450 calories per serving! 1. In a mixing bowl combine the flour salt and chives, mix well. Add the oil. Then add the water a couple tablespoons at a time until the dough forms. Gather dough into a ball. Allow to chill in the refrigerator while you prepare the filling. 2. In a large stock pot heat the oil over high heat. Add the beef stirring to sear on all sides. Season with salt & pepper as its cooking. Cook about 4-6 minutes. 3. When the beef is browned add the onion and celery. Allow the veggies to become translucent about 2-3 minutes then add the tomato sauce and paste. Cook for about 1-2 minutes. 4. Add beef broth, Worcestershire sauce, and hot sauce. Bring to a boil. 5. Add the potatoes, carrots, mushrooms, salt and pepper. Return to a boil then cover and turn down to simmer. Allow to cook for about 10 minutes, until the potatoes and carrots are fork tender. 6. In a small bowl combine the corn starch and water. Mix to form a slurry (thickening agent). 7. Add to the stew and stir until the stew thickens; about 1-2 minutes. 8. Remove from the heat and add the peas. Set aside. 9. Take about 2/3rds of the dough and roll it out into a large circle. Place into the bottom of a large casserole dish. 10. Pour the soup into the dish. 11. Roll out the rest of the dough into a large circle and place on top of the dish. Tuck the dough into the dish under the bottom layer. 12. Bake at 375 degrees for 45-60 minutes or until the crust is golden brown. 14. About 450 calories per serving; at 4 servings. What a nice change from the standard chicken pot pie...love the new blog look!